Ahhhhhhh, spring is officially here! I love walking into the grocery store to see a well stocked shelf of fresh, organic asparagus spears! It is one of my most favorite veggies, and I certainly eat my fill of it while it’s in season these next few months, and then I miss it the rest of the year. *tear* This year I plan to buy some in bulk and freeze for use thru the fall. Hoping to find a fabulous farmer’s market in Charlotte next month when we get moved and settled. When purchasing asparagus, you want to be sure the tips are bright green and tightly closed. 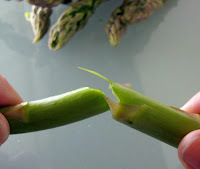 Dark green or black and mushed tips is evidence of oxidation, meaning the asparagus is not fresh. You’ll also want to examine each spear in the bunch, testing for crisp rigidity and bright green color. Be sure the skin of each spear is unwrinkled and firm. The best tasting and best texture will come from spears that are thin to fairly thin in diameter. This isn’t to say you can’t enjoy a thick bunch of asparagus, just that they’ll be a bit stringy and are probably more suited for a stir fry or dish that calls for them to be diced. These tests will ensure a fresh product potent in nutrients! Once you get your asparagus bunch home, it is important to store it properly to keep it fresh with valuable nutrients intact. Trim about a half inch off the bottom ends and place standing up, cut end down, in a glass of 1 inch fresh water. Store in fridge until ready to use. When ready to prepare your asparagus, there is a magical little trick to always remember that will ensure you and your guests have tender asparagus all the way thru. The most tender part of the spear is the tip. As the stalk gets thicker, it gets tougher. There is a magic point somewhere between the tip and the end of the asparagus that separates “tasty-tender” from “icky-tough.” Every bunch of asparagus is different. While you may not know where this breaking point is, but your asparagus does. Hold your asparagus at both ends. Gently bend the asparagus until it snaps. The magic is in that it will naturally break at a point of resistance, and that point is where the stem is too tough to be enjoyable. Do this for all your asparagus. Simple as that, and so worth the two minutes worth of energy! Your dish will taste so much better after performing this step. And now your asparagus spears are ready to dive into your recipe. Spread asparagus on rimmed baking sheet. Coat with olive oil and sprinkle with sea salt. Roast at 350 degrees F for 15-20 minutes until crisp tender. Remove from oven and transfer to serving platter. Drizzle and coat with balsamic vinegar. Serve. 1.) Preheat oven to 400 degrees F. In a small saucepan, add olive oil, garlic, lemon zest, oregano, and red pepper flakes. Heat over Low heat until garlic becomes golden and oil fragrant. Remove from heat. 2.) Place asparagus spears on a rimmed baking sheet. Coat asparagus with infused olive oil. Season with sea salt and pepper. Sprinkle with crumbled feta. Roast for 12-15 minutes. 3.) Remove from oven. Sprinkle with parsley and squeeze the lemon over top. Serve immediately. 1.) In a large saucepan with steamer and lid, get water boiling. Add asparagus to saucepan, cover, and steam for about 6-8 minutes, until crisp tender. 2.) Meanwhile, in a heavy medium skillet over Medium-Low heat, cook the butter until it just begins to brown, about 2 minutes. Remove from heat. Add the thyme leaves. 3.) Once asparagus is cooked tender, remove from steamer and coat with thyme butter sauce in skillet. Season with sea salt and pepper. Transfer to serving platter and serve warm. 1.) In a small bowl, combine the first 5 ingredients with a fork. This is homemade Hoisin sauce. Set aside to allow flavors to combine. 2.) In a large saucepan with steamer and lid, get water boiling. Add asparagus to saucepan, cover, and steam for about 6-8 minutes, until crisp tender. Remove and rinse asparagus in cold water. 3.) In a large skillet, add 2 teaspoons of sesame oil and warm slightly over Medium heat. Add sesame seeds to pan and cook until lightly browned, about 4-5 minutes. Add ginger and garlic and cook 1-2 minutes. Add the homemade Hoisin sauce and asparagus. Stir and cook until asparagus is well coated and heated thru, about 2 minutes. Season with sea salt and white pepper. Transfer to serving dish and serve. 1.) In a large saucepan with steamer and lid, get water boiling. Add asparagus to saucepan, cover, and steam for about 6-8 minutes, until crisp tender. Remove and rinse asparagus in cold water. 2.) In a large skillet, heat olive oil and butter over Medium heat. Add mushrooms and garlic and cook, stirring occasionally, until just cooked and liquid is expelled, about 5-7 minutes. 3.) Add asparagus, Dijon mustard, black pepper, and sea salt. Stir until heated thru. Serve. 1.) In a small skillet, saute shallot coconut oil over Medium-Low heat until golden, about 6 minutes. Remove from heat; cool slightly. 2.) In a large saucepan with steamer and lid, get water boiling. Add asparagus to saucepan, cover, and steam for about 6-8 minutes, until crisp tender. Remove and rinse asparagus in cold water. Place asparagus in shallow glass casserole dish; drizzle with olive oil. 3.) Preheat broiler. In medium bowl, using a pastry cutter or fork, cut butter into the almond meal. With a spoon, stir in Parmesan cheese, parsley, lemon juice, shallot mixture, and 1/4 teaspoon sea salt. Sprinkle almond meal mixture over asparagus. Place dish in broiler 5 inches from heat source. Broil about 4 minutes or until lightly browned. Remove from oven and serve immediately.